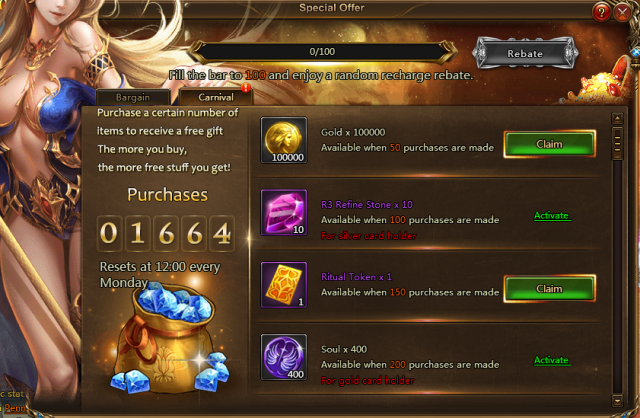 Special Offer is a regular event, which will be released after 7-Day Carnival. During Special Offer, you are able to purchase 6 different items at a discount everyday. The items on sale refresh daily. Here is the most exciting part of Special Offer: the total number of purchase did by all the players of one server will be counted, and as the total number reaches a given number, each player in this server will get rewards! The more players purchase, the more rewards all players may enjoy. * The sum of purchease refreshes every Monday.